I have commented here a few framing and collage apps, generally referring to them as creators of multi photo ‘images’. A new addition to the group (new to me) is InstaCollage. The iPhone app has the features of the many collage apps in the iTunes store, but tuned a bit more towards folks posting to Instagram. 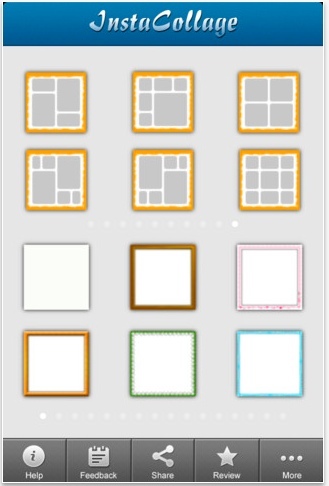 Pick a border/frame/template layout that matches the group of photos that you see being together to deliver the message. It would be too easy to create a post that seemed endless if I try to cover all of the features. You choose a image layout, place images, resize, shake to remove all of them, add a frame, adjust backgrounds, adjust the round corners around the images, frame texture/thickness… Add stamps, text (more than 50 fonts), change style and adjust images with a variety of filters. While InstaCollage appears to be made for posting directly to Instagram, you can also post to Facebook, Twitter, attach to an email, or save to your iPhone’s photo library. 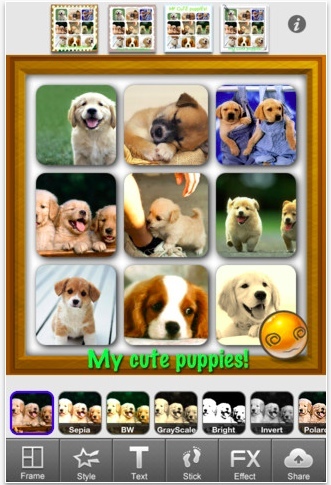 For the more creative, there are collage options now where the images are shapes beyond simple squares too!